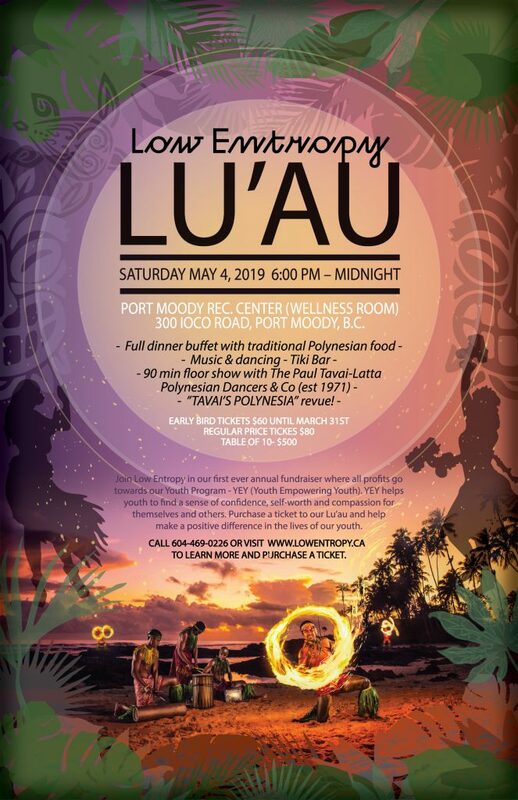 Tickets Available for Low Entropy Lu’au Fundraiser – Saturday, May 4 – Paul Latta Dancers & Co.
Come join us on the evening of Saturday, May 4, 2019 at the Port Moody Recreation Centre for a lu’au fundraiser, hosted by Low Entropy! Low Entropy has a Youth Empowering Youth (YEY) program to help bring awareness to mental health and remove the stigma associated with it. The YEY program also promotes confidence and compassion. The lu’au will have a full dinner buffet with traditional Polynesian food and mini shows performed by us, the Paul Tavai-Latta Polynesian Dancers & Co. throughout the night. Join us for this great cause, good food, and great entertainment! Tickets are on sale on eventbrite. Come Join Us for Our Second Studio Sunday of the Year!